all work and no hiking make me a dull UL-Backpacker. I need something to keep my mind on the outdoors while I am at work, and what better if that something also could make me and others smile as well as keep my ears and head warm. 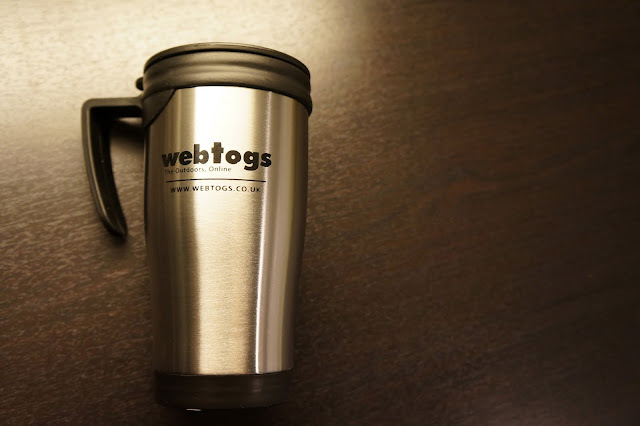 I found out that Webtogs not only have superb customer service, no, they also have ace products. They have a wonderful, colourful The North Face Throwback Beanie which could do all of the above (smiles, warm ears and head, keep my mind on the outdoors while at work). And to help me being a better person, their thermo mug keeps my coffee hot and means I don't need to drink from disposable coffee cups at the office, saving resources and the environment in which I love to hike so much. Sweet stuff, amigos y amigas! And the winner is... Line Nielsen - Congratulations! Please contact me via Email, you got till tomorrow 15 o'clock to get in touch otherwise it goes to the second in line! Thanks everyone else, see you tomorrow at 6 AM!